It seems to come around with ever increasing speed but 9th May saw us back at Kiplin Hall for another Dales Trail . The day started a bit overcast but rapidly improved and by afternoon it was quite a pleasant day. Cars started arriving quite early and by 10 o’clock we had quite a full car park and the tea room was overflowing. A good selection of cars were present with MG A & B s being the main force as usual, but variation was provided by Keith and his sons Healey, the magnificent Aston Martin of Sam and Jane and a good selection of older MG’s and of course our adopted Italian Alfa Romeo of webmaster and main organiser Bry. We also managed to squeeze in a late arrival Citroen 2 CV. 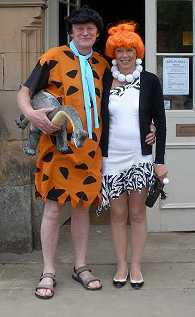 The period dress theme was enthusiastically embarked upon by several club members with Fred Flintstone & Wilma, complete with Dino, who got out of control several times, a pirate and his pirate partner who it seemed had lost their pirate ship and resorted to a Mini. 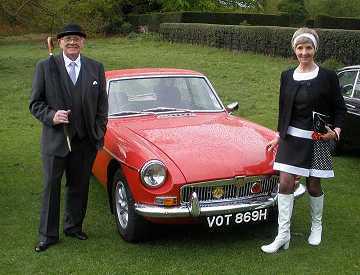 Steed and Mrs. Peel arrived in sparkling form but Mrs. Peel could not be enticed into demonstrating any martial arts or high kicks. A hippy from the 60’s appeared complete with the most outrageous afro hair style, also a game keeper with dangerous trousers and a selection of 1960 styles including Mary Quant direct from Carnaby Street . This all went to create a carnival atmosphere, thanks to all who took the trouble. 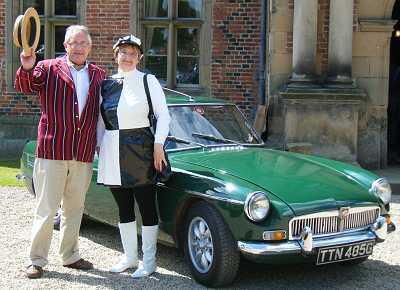 The best turned out crew prize was sponsored by club member Dave Watson (Northallerton Auto Electrics), and was won by Steed and Mrs. Peel, (John & Sally Sleep). Full of tea & biscuits the crews set sail for the dales, a route which took in the some of the highest and most stunning dales scenery including Tan Hill pub which provided a watering hole for Dino and his party. From there a short trip across into Wensleydale and Coverdale which provided another watering hole for Dino and his party and return via Masham which may have provided yet more refreshments for Dino and his party. Back to Kiplin Hall where there was more tea and cakes etc and raffle prizes to be claimed. Thanks to all the members who supported the raffle with an excellent array of prizes, though many had a cork in the top, is this a car club or some other type of club ? However very welcome they were. The display of cars with the Hall as a back drop was a great sight and attracted many members of the public with envious looks, I heard one lady say to her husband in passing, we can have a look but you're not having one! These events do not just happen, so thanks to main organiser Bry for his work assisted by the other club members who did their bit when asked, even if it meant getting caught in the only shower of the day directing traffic, it all went to make a very successful day.